Gourmet Jelly Belly Jelly Beans in a gift box. 20 best flavours! 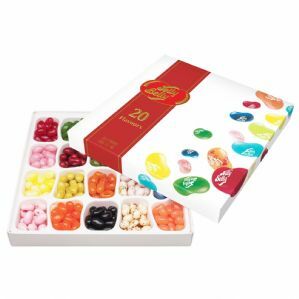 An assortment of 20 individual Jelly Belly flavours presented in a gift box. This ideal present contains 20 flavours in 20 seperate compartments. 250g. For the Jelly Belly aficionado - no other gourmet beans will do. Very Cherry, Green Apple, Coconut, Lemon, Cantaloup Melon, Bubblegum, Plum, Strawberry Cheesecake, Blueberry, Buttered Popcorn, Pina Colada, Juicy Pear, Peach, Pink Grapefruit, Island Punch, Watermelon, Tangerine, Liquorice, Toasted Marshmallow, Candy Floss.